The 26th Arnold Classic event was held at the Veterans Memorial Auditorium, Columbus, Ohio on February 28th & March 1st, 2014. As usual the FIGURE & FITNESS Prejudging was held at the Greater Columbus Convention Center. The naming sponsor was Europa Sports Products. Enjoy a packed DVD of approximately 3 HOURS from the Prejudging and Finals of the Arnold Classic Pro Women's Events. Click here for the large PHOTO GALLERY. This disc contains the COMPLETE PREJUDGING followed by the FINALS for each class, seen in this order: FIGURE, FITNESS & BIKINI. Plus all awards and Arnold’s presentations to the winners from each of these events. Plus an amazing number of Extra Scenes. 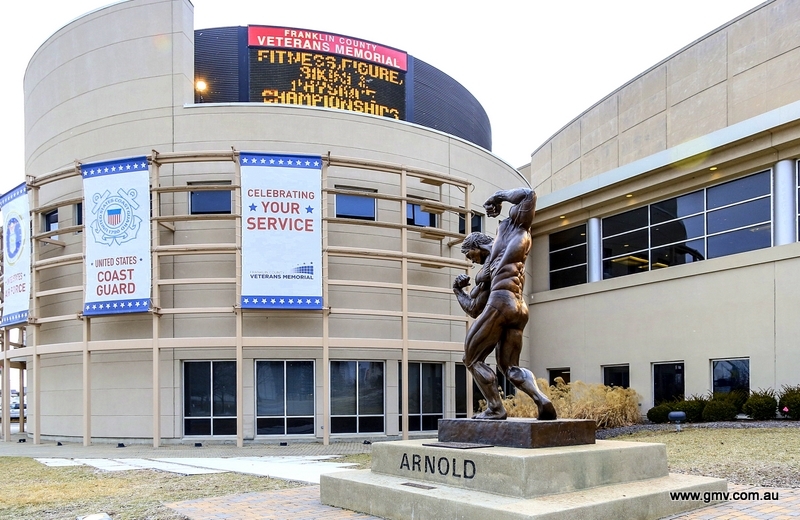 This was a multiple camera shoot using HD cameras at the Veterans Auditorium, (seen below with the Arnold statue), and accordingly producing outstanding video quality. See shortly the PHOTO GALLERY HERE. I would like to specially thank my good friend and longtime helper at the Arnold Classic, JASON BREEZE jasonbreeze.com, for these wonderful contest photos. All classes for each division are shown from prejudging through to their finals, and then on to the next division. Bikini classes - Fitness - Bodyfitness (figure) - Masters Bodyfitness (figure). Congratulations to DENNIS WOLF of Germany for his victory at the final Arnold event to be held at the historic Veterans Memorial Auditorium. It was an emotional and memorable occasion. USA’s Shawn Rhoden placed second with Cedric McMillan in 3rd place. In the Arnold Classic 212 it was a titanic battle between Flex Lewis and David Henry with FLEX LEWIS emerging as the first ever winner of the Arnold Classic 212. The DVD presents the COMPLETE PREJUDGING & FINALS for both classes. Enjoy the complete coverage of this incredible display of skill and strength from Days 1 and 2. This DVD covers every moment of each of the 5 events. You will see the world’s greatest Strongmen in action as they go head – to - head against each other in these unique challenges of strength, power, stamina and determination. The DVD includes the COMPLETE ACTION from all five events: THE AUSTRIAN OAK, THE BALE TOTE (YOKE), TIMBER CARRY, THE TIRE DEADLIFT and THE CYR DUMBBELL LIFT. See Zydrunas as he sets an amazing NEW WORLD RECORD of 524.22 kg/1155.70 lb. on the Hummer Tire Lift. This is the Blu-ray version of the 26th Arnold Classic, held at the Veterans Memorial Auditorium, Columbus, Ohio on February 28th & March 1st, 2014. The inaugural Arnold 212 Prejudging was held at the Greater Columbus Convention Center. It was won by Flex Lewis. The naming sponsor was Europa Sports Products. Congratulations to DENNIS WOLF of Germany for his victory at the final Arnold Classic event to be held at the historic Veterans Memorial Auditorium. It was an emotional and memorable occasion. USA’s Shawn Rhoden placed second with Cedric McMillan in 3rd place.